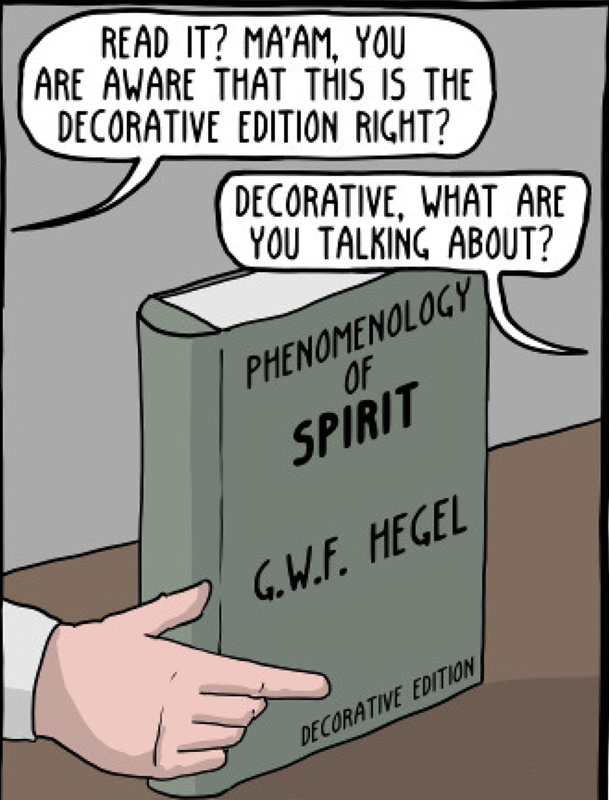 Half-Hour Hegel: The Complete Phenomenology of Spirit (eventually): In the Meantime, A Bit of Fun. . . I'm gearing up for a new round of reading and commentary of Hegel's Phenomenology, starting a bit after the halfway point of January -- we'll be starting the section on Consciousness, with the seemingly pristine origin point of Sense-Certainty! What has been holding me back from jumping right in is that I've been teaching three online classes that started back in December. Two of them are intensive 4-week Ethics classes, and those are just about to finish up this week. I've managed to stay on top of grading, so I hope that by the end of this weekend, I'll be entirely done with those two. For the other, a 10-week World Views and Values class, I've been producing brand new content about one week ahead of my students -- 6 videos a week, 4 2000-3000 word lessons on main ideas, 3-4 handouts -- so that has been taking a lot of my time and energy away from Hegel-related matters. But soon. . . .
Fortunately for me -- since I love to laugh, and since it's also rather thought-provoking -- the creator of Existential Comics, Corey Mohler, has just recently published a vignette entitled The Return Counter. It is indeed possible to purchase "decorative editions" of classic texts, essentially fake books, beautifully bound spines with blank pages, with which one could impress (or at least make some impression) upon guests passing through but not perusing within one's seemingly well-appointed library or study. In fact, it appears that Charles Dickens did so in a particularly enterprising and entertaining manner -- inventing new titles for non-existent but seemingly quite present books. This particular strip -- which I don't want to say too much about, but rather leave it to others to comment and start conversations about -- does stretch plausibility pretty far at least on one point: it's hard to picture too many people in the present actually being able to place a Hegel book in any sort of intellectual context, let alone for it to function as the kind of commodity-fetish that might be of any use in snaring a date or mate!